the large fitness centers are obviously divided into many parts. 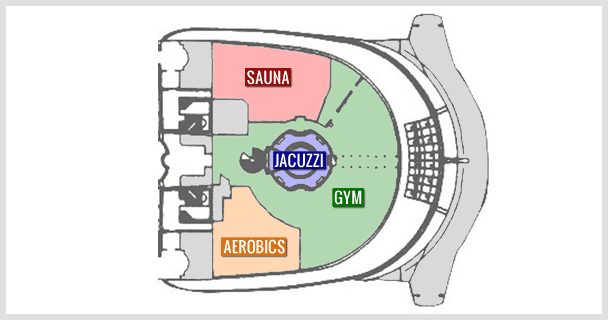 On the first level on deck 11 (called the ShipShape Center, as opposed to the ShipShape Spa on deck 12) lie a huge gymnasium, a room for aerobics and the gents' and ladies' lockers (each with its own sauna and steam rooms). At the center of this complex, one can find an impressive jacuzzi and a spiral staircase leading to the Spa. on Voyager, the decoration is inspired by Ancient Rome. This theme was replaced on Explorer by the Spanish Conquistadores of the 16th century, on Adventure by Venice, on Navigator by the Southern American architecture, and on Mariner by Tuscany.